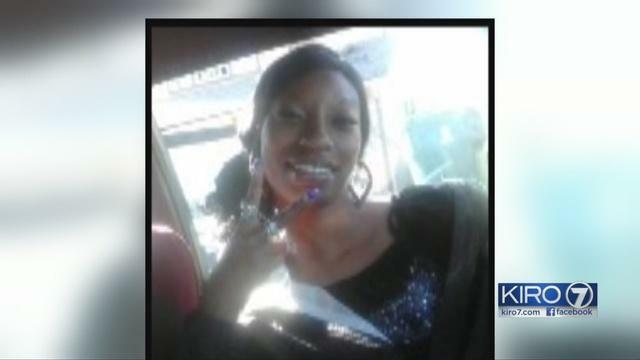 SEATTLE -- A Seattle police officer involved in a fatal shooting asked his partner to use a stun gun on the woman authorities say was brandishing a knife, but police audio transcripts show the other officer said: "I don't have a taser." Authorities say 30-year-old Charleena Lyles confronted the two officers Sunday when they responded to a burglary call at her apartment. Family members have questioned why police didn't use non-lethal options when they knew Lyles had been struggling with mental health issues. The transcript of the police recording released by authorities shows that one of them said "get back" and "Tase her" and the other officer replied: "I don't have a taser." The transcript released by police late Monday shows that one of the officers also said "we need help" and they were facing "a woman with two knives." According to the transcript Lyles also said "Get ready (expletive)." The initial conversation between the pregnant woman and the two Seattle police officers seemed polite, professional and calm. She let them into her apartment. They asked her about the video game console she reported stolen. But the confrontation quickly erupted. A police audio recording has the officers shouting "get back!" and the woman saying "do it! do it!" About 15 seconds elapsed from the officers' first verbal warning to the shots being fired, reports the Seattle Times. Three children were inside the apartment at the time and were unhurt, reports CBS affiliate KIRO. They were taken into protective custody. Seattle Police Chief Kathleen O'Toole told the paper Monday that neither officer was armed with a taser. Seattle officers are given the option of carrying a taser, pepper spray or a baton as a less-than-lethal option, the paper reports. ""The message I'm trying to get out right now is that this is a horrible tragedy all around," O'Toole told the paper. "The community is distraught. The family is distraught. The officers are distraught." She promised her department would conduct a transparent investigation. Lyles' killing came less than two weeks after authorities say she threatened officers with long metal shears when they responded to a domestic disturbance at her home. On Sunday, near the beginning of the roughly four-minute police audio recording and before they reach the apartment, the officers discussed a "safety caution" about the address stemming from the previous law enforcement interaction with the woman. The officers talk about the woman previously waving large metal shears and trying to prevent officers from leaving her apartment, and making "weird statements" about her and her daughter turning into wolves. She was released from jail Wednesday on the condition that she check-in twice a week with a case manager and possess no weapons, jail records show. The shooting occurred as Seattle police are under federal oversight following a 2011 investigation that found officers were too quick to use force. All Seattle officers receive training on how to better handle those with mental illness or abusing drugs. Family members of Lyles questioned why police didn't use a non-lethal options when they knew she had mental health issues. Her cousin, Kenny Isabell, pastor of The Way of Holiness Church of God in Seattle, also said he was frustrated with police killing black people. "Do our lives really matter to them?" he asked. Police have declined to release the names and races of the officers involved in the shooting. Isabell described Lyles as depressed but not violent and said she "was going through some things in her life." During the June 5 incident, Lyles spoke about wanting to "morph into a wolf" and made "several unusual religious comments talking about how the police officers were devils and also members of the KKK," Officer Davidson Lim wrote in a police report. On that day, she finally dropped the shears after two officers drew their guns and repeatedly asked her to do so. "After talking with Lyles' family, we learned that Lyles had experienced a recent sudden and rapid decline in her mental health," Lim wrote in the incident report obtained by KIRO. "When we explained to her family the behavior and statements Lyles made to us, they were surprised and informed us she has not had any behavior similar to this in the past. Lyles' family is concerned for her and they have a strong desire to stabilize her mental health condition before it gets worse." On Monday evening, police released video that shows the two officers walking to the apartment Sunday and discussing the previous call to the woman's residence. The footage, which is from the officers' dashcam and from a camera in the hallway outside the woman's apartment, does not show the Sunday shooting. The video from the apartment hallway has no audio, but it shows the officers entering the apartment. At the end of the video, an officer can be seen partially backing out of the doorway with his arms raised. A court-appointed monitor overseeing use-of-force reforms has found that in responding to roughly 10,000 incidents a year in which people are in behavioral crisis, Seattle officers use force just 2 percent of the time. And in the vast majority of those instances, officers used the lowest level of force. Mayor Ed Murray called the shooting of Lyles a tragedy. "This will be fully investigated," he said.